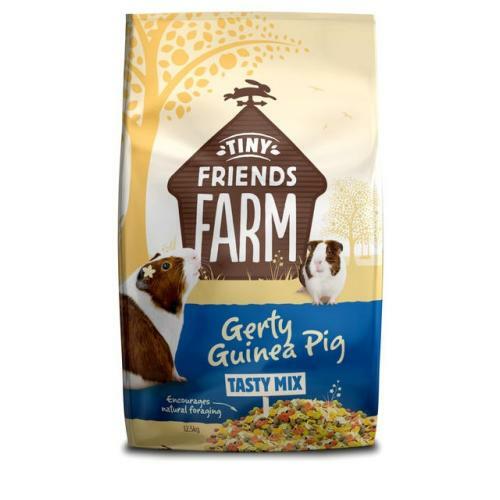 Supreme Gerty Guinea Pig Tasty Mix is a nutritionally balanced food suitable for guinea pigs of all ages, shapes and sizes! Containing delicious ingredients such as maize, oats, wheat, wheat, peas and lucerne as well as vitamin C, it offers a delicious everyday diet that promotes your pet's natural well being and vitality. Hay and water should always be freely available. Nutritionally complete and balanced diet. Added vitamin C – 250mg/kg, an essential daily requirement. Enhances digestive health & dental wear with optimum fibre levels. Rich in fibre – 10% with Lucerne known for its quality. Carefully blended natural ingredients for interest and enjoyment. The average adult guinea pig will require 40‐50g/day of Gerty Guinea Pig. Fresh vegetables should also be provided along with good quality hay and clean drinking water.